Attention drum corps fanatics: Our award-winning weekly e-newsletter DCI.now is moving to Fridays. DCI.now keeps you in step with the buzz of the drum corps activity. Breaking news, contests, feature articles, giveaways and more—DCI.now brings it all to your e-mail inbox. Ramp yourself up for the weekend as Drum Corps International feeds you the latest and greatest information from the world of drum corps. Not signed up? Simply enter your e-mail address here. While you restlessly wait for this Friday's newsletter, check out these last three editions of DCI.now. 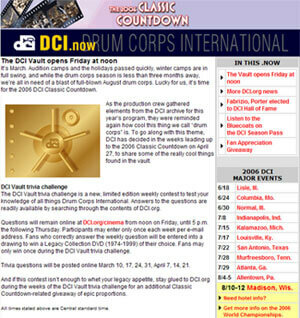 March 8: "New DCI Vault trivia promotion, 2006 Hall of Fame class announced"
March 1: "Introducing the rookies, Research the 2006 DCI Classic Countdown repertoires"
Feb. 22: "Seven years with the Cadets, 2006 DCI Classic Countdown repertoires/playlist"